Bundle and save with packages to suit all budgets. WiFi Modem provided with all services. If you give us a 18 month contract – we will install everything for free in your home at the location that suits you best. We can have you connected in 4 working days on receipt of your signed contract and bank details. We don’t post you the equipment in a box, we come and install it for your as part of our service. We will also help you to connect up all your devices such as your smart TV’s etc so you get the best performance from a Ethernet wired connection. 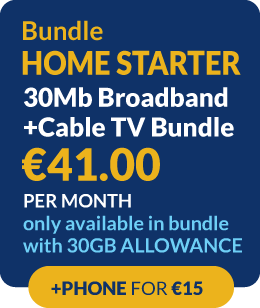 Only €10/€15 to add 043 landline. Your €10/€15 includes for Ireland and UK landline calls.